Byron and Lincoln Ryman were born within a minute of each other, first Byron (3lb 6oz) was precisely three times bigger than his brother. 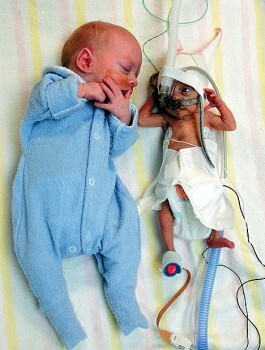 Eleven weeks premature, both boys were given a little chance of survival – particularly Lincoln, weighing only 1lb 2oz at birth. But yesterday this twins, now they are five weeks old, are doing well, thanks to the dedicated staff at the Royal Hospital for Women in Sydney. This is called twin-to-twin transfusion, where one of the blood flow of one of the babies goes from the smaller to the larger twin. “We’re now watching both boys carefully, particularly little Lincoln, but we hope that he’ll soon start gaining weight much more quickly and get nearer and nearer his brother,” said Dr. Mishra. Tiana, I think what people mean by saying ‘God bless’ is wishing the twins and their family strength, fortitude and grace through this. No matter your own philosophical or religious views, I think it’s ill advised to criticize the comfort offered to this family by strangers who learned of their story and were moved by it. All you’re doing is negating the hopes and wishes for the boys’ health. By all meands, send them good vibes and happy thoughts, but debate your beliefs in a more appropriate forum. Not to be rude, but all of you people saying “God bless” them, must REALLY be clueless. If we leave their survival up to god, nothing will get done. So instead of saying “May the lord be with them” say, “May the finest science and medical technology be with them”. It would make more sense! may god bless the 2 children. yes both. God bless these two adorable little boys. Please help them get through this hard time, and let their parents benefit from it. These are so adorable! god works in some strange ways dont he….these little guys are gonna be just fine… god said have faith the size of a mustard seed…. my son is two now when he was born he was 5 pounds 3.3 onces…. doc told me i would never be able to have kid….. see hes here….. doctors are good…… n dont know everthing god has planned…… keep up the faith…. how are these babies doing now? God is good.thank God for sparing the life of your kids.may God be with you. I have twins that are four months now they are well.My dear what i know is that your boys belong to almighty and the God we serve is a God of miracles, Those are the mighty men of Israel i beleive their lives will be testimonies that will help a lot of people. May the Lord be with you and your family. Read Jeremaih 29v11. sorry just found your story, im so happy for you i had twins bradley and callum at 26weeks we didnt know they had twin to twin until they had passed away, they said if my boys would have waited one more week when i was due for a scan they might have been able to help them. omg, we wish the best for these two incredible angels. he is so small and cute. My mom will love 2 have a baby that small and cute.My mom is very good at putting babies 2 sleep, and feeding them. I have a baby cousin that is turning 7mthon the 28th day this mounth. I’m only 11 years old and i like babys that can walk ,talk,and figth. and that is how much me and my mom love babies. This is 2 lovely. This picture is incredible. I myself have twins and they too suffered Twin-to-Twin. It is incredible how strong babies with this condition can be. My girls were 13 weeks early and are now happy and healthy 5 month olds. This photo gave me hope and helped me through my pregnancy. Thank you for sharing their story! I hope that the both of them will have a successful medical intervention for their conditions. I’m wishing the very best for they boys’ future, God bless you all.